It’s usual for players to describe aerial perspective racing games as Micro Machines lookalikes. However, I’m sorry to be the one to break this to the world, but Micro Machines wasn’t actually that good. Games like Mashed perfected the concept, but there is so much space for good games of this particular genre. And so enters Mad Race, a freeware racing game that is surely unknown to most players, but is a great title nonetheless. Here we have racing with guns, from an aerial perspective but more Mashed than Micro Machines. And, despite a couple of quirks, it is one of the best of its kind. First of all, we have a tournament mode, and this offers us 16 tracks split over different scenarios, places like forest, beach or canyon. 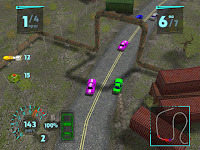 Seven cars race at once and you must arrive in first place to unlock the next track. In case of failure not all is lost, since credits are added up and allow us to buy better cars and customize the weapon slots. Although fictional, the eight available cars occasionally resemble some real counterparts, like Audi, Mercedes or Lamborghini. Each one has different attributes, like acceleration or max speed. 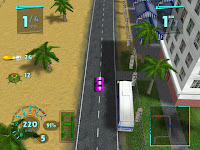 Weaponry plays a major part in the game, since cars can take damage and explode, giving credits to the player in case is the responsible for others’ destruction. Vehicles have one rear and one front slot, ready to be equipped with things like missiles, mines, machine-guns, oil spots and the like. There’s also a slot for a different device, something that improves driving or armor. Driving feels great and there’s not a moment to rest, since rival AI is always doing its best – and cheating. However, what’s fantastic is that although Mad Race can be a very challenging game, the other cars are constantly fighting between themselves and crashing into obstacles, so you’re not always the center of attention. It’s a very clever game. Graphics are great. The small cars are perfectly rendered and scenery is very detailed, with nice colors. You’d be excused to think Mad Race is a commercial game. >So, what are the negative aspects on this one? Well, the game’s camera, which is over-sensitive, reacting to every action the player takes. It should be more forgiving. And if I’m allowed to nitpick, a two-player mode would be great. >But there’s no two ways to look at it, Mad Race is a fabulous racing game. It’s delightful to look at, fun and challenging to booth. Download it and show Micro Machines a thing or two.